The importance of investment in children’s pre-school years for their later life outcomes is increasingly recognised by policymakers. This column surveys the evidence on early childhood development policies in both developed and developing countries. Research suggests that effective education programmes can be implemented at scale even in low-income settings, but the quality of the service and adapting it to the local context are crucial. Sustaining the gains from intervention in the ‘early years’ is also likely to require continuing investment at later stages of childhood. The importance of investment in children’s pre-school years for their later life outcomes is increasingly being recognised by policymakers around the world. A growing number of lower- and middle-income countries (LMICs) are planning or implementing early childhood policies. This flurry of activity has immense potential, but also brings with it substantial risks: if the returns to these new programmes do not quite meet the high expectations set by the returns that are often advertised, the hard-won political will and public support in this area may be lost again. The recent rapid expansion of primary education across the developing world has shown that a focus on increasing access can bring many more children to school, but it will have disappointing effects on their attainment if it is not accompanied by sufficient investment to sustain quality. According to Young Lives, an international study following the lives of 12,000 children in poverty, despite having access to primary education, in 2006, over a quarter of the 12 year-olds in the study’s Peruvian and Indian samples and about a half of the 12 year-olds in the Ethiopian sample did not reach the ‘low international benchmark’ of having basic mathematical knowledge. This compares with 7% of 10 year-olds in the UK in 20031 (Singh 2014). As low-income countries begin to invest more in early childhood development (ECD) policy, similar issues will undoubtedly arise. The government of Ethiopia, for example, has announced highly ambitious plans for the roll-out of pre-school from a gross enrolment rate of about 4.2% in 2008/09 to 80% by 2020 (Ethiopia Ministry of Education 2016). Ghana has already introduced two years of kindergarten into the state primary education system; and Rwanda recently launched a new strategic plan to improve access to pre-primary education over the next five years (Rwanda Ministry of Education 2013). Why may we not see returns to these investments? Because implementing effective ECD policies is hard. The evidence shows that there have been some great successes, but equally there have been some failures and the jury is still out in many cases, especially on the issues of scaling up ECD interventions and sustaining early impacts. Now is a crucial time to take stock of what we already know and to be clear about what we do not know. At the Institute for Fiscal Studies (IFS), we have studied early childhood development and policies from the perspective of developed and developing countries. To consolidate the current state of knowledge and identify future directions for research, the Centre for the Evaluation of Development Policies (EDePo) at the IFS and the Inter-American Development Bank (IDB) are organising a conference, “The early years: child well-being and the role of public policy”, which will bring together researchers working on ECD across disciplines and geographical regions (see http://www.ifs.org.uk/events/1289). So what do our findings tell us so far and what questions remain? The first lesson from the research evidence is that early childhood programmes shown to be effective at pilot stage, in carefully controlled environments and often using highly skilled professionals, can be effectively adapted for implementation at scale using locally available resources and infrastructure in low-income settings. The best known and most widely studied ECD interventions – such as the High/Scope Perry Preschool Program (Heckman et al. 2010), the Abecedarian project (Barnett and Masse 2007) and the Jamaica project (Grantham-McGregor et al. 1991, Gertler et al. 2014) – achieved impressive improvements across key developmental domains in the short term, which translated into improvements in adult outcomes. But these programmes were implemented on very small scales and, with the exception of the Jamaica project, used highly skilled professionals. In partnership with others, IFS researchers are generating some of the first evidence on the feasibility of implementing such programmes in LMIC settings at scale. In Colombia, for example, we adapted the Jamaican home-visitation model to the local context by training local female leaders involved in the administration of a national welfare programme to deliver the home visits. These visits are aimed at promoting children’s stimulation by encouraging mothers to teach skills and concepts in daily routine activities. After 18 months of home visitation, children in the treatment group had significantly higher cognition and receptive language than the control group (Attanasio et al. 2015). 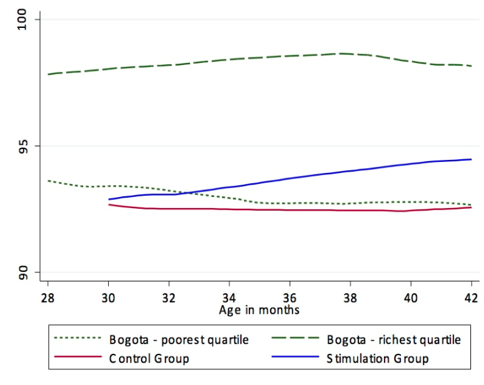 To assess how large these gains are, we compare the average cognition of children in the control group and in the treated group at the end of the intervention with the cognition of children in the poorest and richest quartiles of Bogota (using the Bayley scale for cognition). 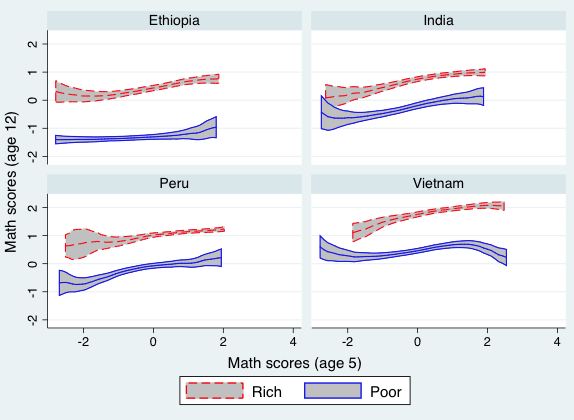 As Figure 1 reveals, the magnitude of the improvements is striking and equivalent to closing over a third of the gap between children in the top and bottom wealth quartiles in Bogota. These results suggest that, at least in the short term, the implementation model for delivering stimulation works and may serve as a promising blueprint for future ECD policies; whether these will persist in the medium and long term remains to be seen. In the Colombian case, using socially prominent local women whom the community know and trust to deliver the intervention was crucial: on the one hand, it kept costs down; and on the other hand, it helped the communities take ownership of the intervention. This latter aspect is key for interventions that aim to change individual behaviour that is often based on entrenched beliefs and attitudes. The intervention piggy-backed on existing services to identify the ‘right’ individuals. Going forward, it will be crucial to understand precisely how to adjust interventions in each context so that they can be delivered at scale in the most cost-effective manner. Important questions will include identifying what aspects of local institutions and personnel should be leveraged and whether there are cheaper models of delivery that can yield the same returns. At IFS, we are starting to tackle these questions. In work in progress, we have adapted the home-visitation intervention we studied in Colombia to the Indian state of Orissa. We are using the infrastructure of a large well-established education NGO to implement the intervention, while at the same time testing the relative effectiveness of delivery in groups compared with individually at home. The group delivery model is clearly cheaper; whether it will yield bigger or smaller impacts is an open question. These questions will be central to the EDePo/IDB conference. Sally Grantham-McGregor will take stock of learning on these questions from over 40 years of experience designing, implementing and evaluating parenting programmes in LMIC settings. Caridad Araujo will present the first results of a large-scale intervention in Peru, where the government has been scaling up the Colombian model of delivery. The second lesson from the research evidence is that the quality of the service delivered in early childhood programmes is crucial for their effectiveness. Despite the widely cited high returns to programmes such as Perry Preschool and the high impacts reported in descriptive studies of pre-school effects in developing countries (e.g. Woldehanna and Gebremedhin 2012), the evidence on universal pre-school programmes is in fact very mixed. For example, recent work on the large-scale expansion of free (or highly subsidised) pre-school education in the UK and Quebec shows few effects on child development (Blanden et al. 2016, Baker et al. 2008); the few studies of LMICs also show mixed results with examples of both positive and null (at times negative) effects on child development and health (Berlinski et al. 2009, Bernal and Fernandez 2013, Rosero and Oosterbeek 2011). The reasons behind the small, if at all existent, effects of these large-scale programmes are not fully understood, but one of the most plausible hypotheses is that the quality of these programmes was diluted with their wide expansion. Indeed, a persistent finding across contexts is that quality of the children’s pedagogical experience really matters. Just as in the schooling literature, there is little evidence of significant impacts of structural quality (physical infrastructure, quality of furnishings and space) on learning, so for pre-school education, well equipped buildings and lower child-teacher ratios alone do not seem to be enough (Hanushek and Rivkin 2012). Our work in progress in Colombia supports these findings: an evaluation of a government programme to transform parental family day-care units into large childcare centres of higher structural quality shows no impacts on child developmental outcomes (Bernal et al. 2016). At the EDePo/IDB conference, we will hear further about the substantial impacts that a high quality childcare programme can achieve in LMIC settings from Raquel Bernal and about the relative merits of investing in material and human resources available to pre-schools versus pedagogical training from Sonya Krutikova. While evidence suggesting that quality is essential is mounting, we still have a limited understanding of what exactly are the key ingredients for childcare quality, especially in application to centre-based care. A promising avenue is the use of innovative measures of teaching style and interactions between parents/teachers and children that capture multiple dimensions of quality. Steps in this direction have recently been made in a number of studies represented at the conference in presentations by Yyannú Cruz-Aguayo and Flavio Cunha. The third lesson from the research evidence is that scalable early childhood programmes need a well-defined fully specified curriculum and implementation methodology adapted to the local context. At the pilot stage, interventions delivered by highly trained professionals can and should allow for flexibility to enable them to exercise their expertise in tailoring the curriculum to the needs of the child. But when scaling up programmes by drawing on local material and human resources, implementers are often no longer professionals with expertise in child development and it is necessary to adjust the intervention in a way that maximises fidelity to the original model. Our experience suggests that a detailed, structured and easy-to-follow curriculum and implementation guidelines are crucial. In the Colombian home-visitation intervention, for example, the curriculum prescribed specific activities for each week and included specific instructions in simple language to match activities to the child’s age and level of development (Attanasio et al. 2015). The challenge is to develop this curriculum in a way that allows for sufficient flexibility to suit children of different development levels, but at the time ensures that every child benefits from its key elements and a well-structured learning programme. If adapting interventions from other contexts, an essential ingredient is that the agencies and personnel tasked with adapting the programme not only have knowledge of local culture and parenting practices, but also understand and respect the underlying philosophy of the interventions. In addition, it is essential that any teaching material is adapted to the level of those who will be implementing it and that in contexts where these individuals have low levels of education and expertise in child development, robust systems of supervision and monitoring are in place. At the EDePo/IDB conference, Sally Grantham-McGregor will share her wealth of experience in adapting home-visiting curricula for implementation in various LMIC contexts. Hiro Yoshikawa will present a detailed study of implementation of an ambitious programme to improve the quality of pre-school provision in Chile: this is a good example of the challenges associated with maintaining fidelity in centre-based ECD programmes at scale. The final lesson from the research evidence is that sustaining gains from early interventions is likely to require continuing investment at later childhood stages. Our work on the dynamics of disadvantage suggests not only that developmental delays among disadvantaged children can be detected as early as 12 months (Rubio-Codina et al. 2015), but also that what happens at each stage of childhood matters. Figure 2 shows evidence from work in progress by Krutikova and Singh. We use the Young Lives data with repeated observations on the same children to relate achievement in mathematics at age 12 to that at age 5 using non-parametric plots (Figure 2), separately for children in the lowest and highest quartiles (blue and red lines in Figure 2 respectively). The results show that even when disadvantaged children have the same mathematics skills as better off children at age 5, new gaps as large as 1.5 standard deviations open up by age 12. The picture looks very similar between the ages of 12 and 15, as well as when using measures of receptive vocabulary. This may in part explain the commonly found fade-out of early childhood intervention effects (at least in the domains for which they are initially observed) and suggests that optimal childhood intervention may be a multi-stage process. Indeed, as emphasised in the literature, sustaining any gains achieved from early interventions, even in the case of the pilot studies, can be tricky. We observe many cases in which early impacts fade out, sometimes to reappear later on, possibly in different domains (see overview by Bailey et al. 2015). How the main actors – parents and pre-school teachers/headmasters – make decisions about how they invest in children. This knowledge will help us understand how interventions can be designed to change these behaviours sustainably and how interventions over different phases of the life cycle of children (home visits, centre-based care) interact and should be integrated. Future work at IFS will explore the complementarities between early childhood home stimulation programmes and subsequent pre-school interventions and how early to intervene so that all children start school on a level playing field. Some of these questions will be addressed at the EDePo/IDB conference: Karen Macours and Costas Meghir will speak about the specific mechanisms underlying the effects of parenting programmes in different contexts; while Pedro Carneiro will discuss a study of a group administered parenting programme in Chile that explores specific mechanisms for sustaining impacts over the medium run. Bailey, D, GJ Duncan, C Odgers, and W Yu (2015), ‘Persistence and Fadeout in the Impacts of Child and Adolescent Interventions’, Life Course Centre Working Paper Series No. 2015-27. Baker, M, J Gruber, and K Milligan (2008), ‘Universal Child Care, Maternal Labor Supply and Family Well-being’, Journal of Political Economy 116(4): 709-45. Berlinski, S, S Galiani, and P Gertler (2009), ‘The Effect of Pre-primary Education on Primary School Performance’, Journal of Public Economics 93(1-2): 219-34. Barnett, W, and N Masse (2007), ‘Comparative Benefit-cost Analysis of the Abecedarian Program and its Policy Implications’, Economics of Education Review 26(1): 113-25. Bernal, R, and C Fernández (2013), ‘Subsidized Childcare and Child Development in Colombia: Effects of Hogares Comunitarios de Bienestar as a Function of Timing and Length of Exposure’, Social Science and Medicine 97: 241-49. Bernal, R, O Attanasio, X Pena, and M Vera-Hernandez (2016), ‘The Effects of the Transition from Home-based Community Nurseries to Childcare Centers on Children in Colombia’, mimeo. Blanden, J, E Del Bono, S McNally, and B Rabe (2016), ‘Universal Pre-school Education: The Case of Public Funding with Private Provision’, Economic Journal 126: 682-723. Ethiopia Ministry of Education (2016), ‘Education Sector Development Programme V: 2015/16-2019/20’, Addis Ababa. Gertler, P, J Heckman, R Pinto, A Zanolini, C Vermeerch, S Walker, S Chang, and S Grantham-McGregor (2014), ‘Labor Market Returns to an Early Childhood Stimulation Intervention in Jamaica’, Science 344(6187): 998-1001. Grantham-McGregor, S, C Powell, S Walker, and J Himes (1991), ‘Nutritional Supplementation, Psychosocial Stimulation, and Mental Development of Stunted Children: The Jamaican Study’ The Lancet 338(8758): 1-5. Hanushek, E, and S Rivkin, (2012), ‘The Distribution of Teacher Quality and Implications for Policy’, Annual Review of Economics 4: 131-57. Heckman, J, S Moon, R Pinto, P Savelyev, and A Yavitz (2010), ‘The Rate of Return to the High Scope Perry Preschool Program’, Journal of Public Economics 94: 114-28. Rwanda Ministry of Education (2013), ‘Education Sector Strategic Plan 2013/14-2017/18’, Kigali. Rosero, J and H Oosterbeek (2011), ‘Trade-offs between Different Early Childhood Interventions: Evidence from Ecuador’, Tinbergen Institute Discussion Paper No. 102/3. Rubio-Codina, M, O Attanasio, C Meghir, N Varela, and S Grantham-McGregor (2015), ‘The Socio-economic Gradient of Child Development: Cross sectional Evidence from Children 6-42 months in Bogota’, Journal of Human Resources 50(2): 464-83. Singh, A (2014), ‘Emergence and Evolution of Learning Gaps across Countries: Panel Evidence from Ethiopia, India, Peru and Vietnam’, Young Lives Working Paper No. 124. Woldehanna, T, and L Gebremedhin (2012), ‘The Effects of Pre-school Attendance on the Cognitive Development of Urban Children aged 5 and 8 Years: Evidence from Ethiopia’, Young Lives Working Paper No. 89. It should be noted though that the Young Lives samples are pro-poor while the UK one is not.